Thinking about doing some below freezing bike commuting? First of, you are not crazy and if you are prepared then you will be fine so don’t talk yourself out of it before you even start! 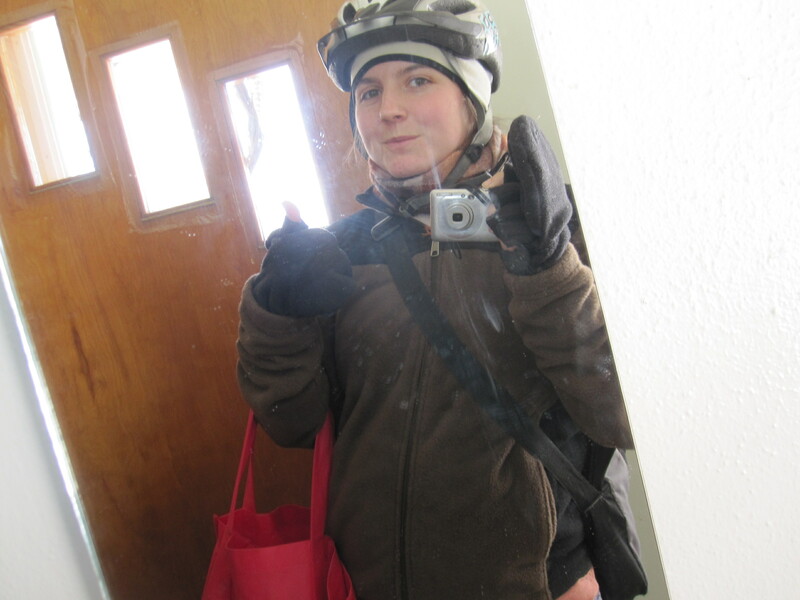 Biking to work this morning, I excitedly noted the temperature as I passed the hardware store’s large blinking sign– 9 degrees Fahrenheit Sometimes you have to just give yourself a pat on the back and biking when it is 9 degrees outside definitely warrants some back patting! It didn’t even feel that cold but I am sure that is because I was just so excited to be back on my bike! For the past couple of weeks we have been getting pretty regular snow here. Snow combined with lots of temperature variation has made the roads an absolute mess. After one scary situation with a car (I’m fine, Mom! Don’t freak out!) my trusty bicycle was sentenced to the garage for a while and instead I took to walking everywhere. I’m not afraid of the cold. In fact, I find that I thrive in these long winters! I could never live somewhere tropical. Besides, all my jobs are within a mile and a half of my house so it’s not like I have to go super far anyway. The roads have cleared nicely now and yesterday was my first day back on my bike. It felt great to be moving fast again! The most important thing to remember when winter biking is to have as much skin covered as possible. If you are particularly sensitive to cold then I suggest getting something to cover your face. [Make sure not to obstruct your vision!] On the days I have biked with a subzero wind chill I am usually find just wrapping a scarf around over my mouth and nose. Never under estimate or forget about windchill. If it feels cold when you stick your hand out the car window on a hot summer day then just imagine how cold it feels to have your whole body against that wind when it is freezing out! COLD! It’s also important that your ears are covered. A beanie under a helmet can often times be good enough but wearing a special ear covering headband under my hat under my helmet is de-luxe. Gloves are imperative for winter riding. I wear fleece mittens that are convertible to fingerless gloves. As far as the rest of your clothing goes I think that really depends on how far you are going and the terrain you will be going over. My ride to work is pretty evenly split between uphill and downhill with a long down hill at the end. I follow the same ethic I do for backpacking which is start cold. I find that if I start biking in my fleece and down jacket then I will be sweating bullets by the time I get to work. Today I simply wore my work clothes (jeans and a flannel shirt) with a heavy fleece and scarf over top. If I am going for a longer ride then I add a wind proof layer on both top and bottom like a wind breaker or rain jacket. Several days I chose to where a long sleeve with a fleece vest and my down jacket. It’s really up to you and it takes a while to learn your preferences. I am a big supporter of working with what you have instead of buying new fancy stuff. “Cotton Kills,” we outdoor educators always say so if you can try and have synthetic or woolen layers closest to your skin! Lastly, REMEMBER TO ALWAYS BE SAFE! Wear a properly fitting helmet, bright clothes at night, and make use of lights and reflectors during dawn, dusk, and night hours. Biking during the winter is extremely rewarding and super fun. I was really nervous at first because I don’t have a fancy bike or fancy tires but it has truly been a great winter of biking. I’ve pushed my limits and my comfort zone and have had a blast! Every Sunday in Annie world is Sunday Funday– a day for doing something special for yourself. For this Sunday Funday we decided to go up to La Crosse for some hiking and coffee shop time. La Crosse is snuggled between the Mississippi River and these beautiful, towering bluffs. The hiking trails, obviously, are located either near the river or up on the bluffs. For our first La Crosse hiking adventure we decided to try the bluffs. Before hiking, however, we stopped at Grandad bluff. From the top we could see all of La Crosse and the Mississippi! We even had the good fortune to have a train go through town while we were up there so La Crosse looked like a tiny train set! After Grandad Bluff we headed over towards the Hixon Forest Trails where we went on some long windy hikes on the Human Powered Trails. There was no one else out there so we got to enjoy it at our own pace. The best part was playing Nature Detective. We hiked for a few miles and then after getting sufficiently turned around we found a trail that lead us back to the parking lot. These trails and the land they are on is very cool because it is home to a prairie restoration project. The Driftless region used to be mainly oak savanna and prairie and prairie restoration projects are popping up all over the place. I definitely plan on going back there in the Spring. I love this! Simple and useful. Though not now of course. Milkweed seed pods make perfect elf ears! Someone has been eating nuts! I wonder what this was! And from when! Before reaching the trailhead we stopped to take some cheesy perspective pictures. In the parking lot there is a NOAA doppler station. The instrument used for doppler radar looks like a giant volleyball sitting atop a metal stand. When you are near it you can hear it hum. My brother and I were weather nerds when we were kids– okay just plain nerds– and read all these junior meteorologist books. We loved our barometer and would always predict the upcoming weather. We would have loved this giant volley ball station as children! Post hiking we descended the bluff into town and read for a while at Jule’s Coffee Shop. Jamie is currently reading the Harry Potter series (which he originally started to appease me and has since gotten really into) and I am reading 1491: New Revelations of the Americas Before Columbus. We read for a hour or two, ate some dinner, and then headed home. All and all it was a fabulous day and a Sunday Funday success! Camp Waziyatah adventure when I was 15. 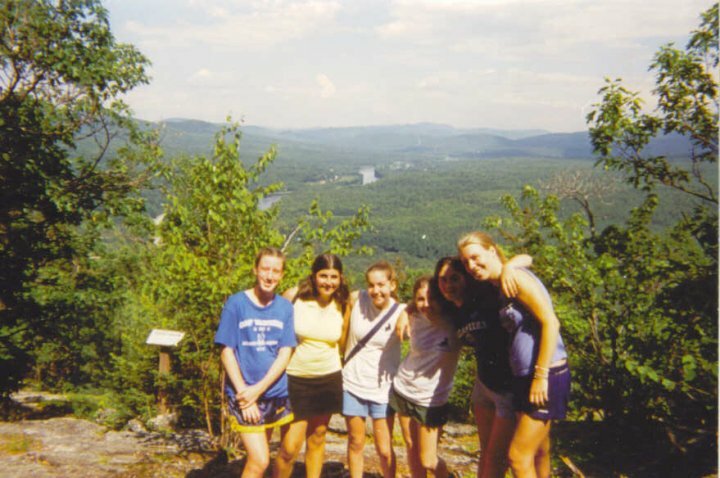 At 13, I started going away each summer to sleepaway camp in Maine and the spark for summer adventure was lit. Summer camp became my passion in life and what kept me going through what I always felt were boring winters on Cape Cod. After 4 summers in Maine I moved on to New Hampshire then Pennsylvania then New York. After college, which was already nearly 1000 miles away from home in North Carolina, I moved to California. I spent each summer for a decade at camp! After a year in CA, I landed here in Wisconsin at the beginning of last summer and experienced my first season without camp. I told myself it was okay because I was in a new place and learning things so it was kind of like being a camper again. 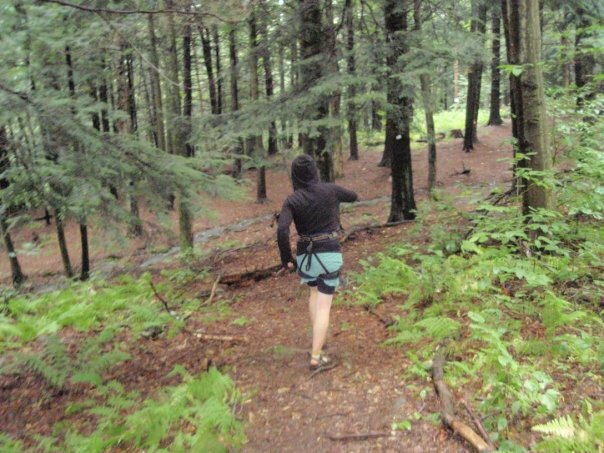 When summer started this year I didn’t pack a duffle and head out the door for the first time– instead I stayed put and found adventure right here at home. I had brilliant climbing days, swam in beautiful lakes, biked everywhere I could, grew three fantastic gardens, hiked exciting new trails, grew closer with my partner, made new friends, and took/taught more classes with Driftless Folk School. At one point I even attended a talent show show in town that felt straight out of summer camp. While at first I felt restless, I am now appreciative to have spent the summer here in the Driftless learning about myself, my community, and this beautiful area. On the road again! Jamie and I went on another Driftless Folk School sponsored adventure this week—Oregon, Illinois for the Oregon Renewable Energy Fair. The fair itself was kind of a bust because the attendance was so low but we enjoyed exploring the area. Our first night there we went our to Dekalb for dinner because we saw they had a food co-op and figured that would mean other cool things as well. We were most impressed with their beautiful artwork all around town. One mural was particularly stunning and I couldn’t help being a tourist and taking a bunch of pictures. Since the Kickapoo Country Fair, Jamie and I have been on a gluten free diet to see if it helps us out at all so finding a good place to eat was difficult. We finally settled on a cool looking coffee shop where they served us the most delicious PESTO nachos! On the way home (we skipped out early) we stopped in Galena as suggested by our friend Jacob. The town has an amazing downtown with loads and loads of fancy little shops. We went to one place that sold canned goods where you could sample everything before buying it. Naturally Jamie and I went around trying all the different jams, salsas, spreads, etc and took some mental notes on things we could make and can ourselves. Special Note: Look closely at the sunset picture and you will see something unusual. The Renewable Energy fair was in the shadow of a nuclear power plant—eeks! Move out day from the cabin is fast approaching and Jamie and I really need a new place to live! We are looking for house or cabin or really anything decent near or outside of Viroqua. I’d love to be able to bike into town– with the new bike trail that means Westby is also a possibility! We would like to have enough space to grow lots of veggies and raise a couple of chickens. 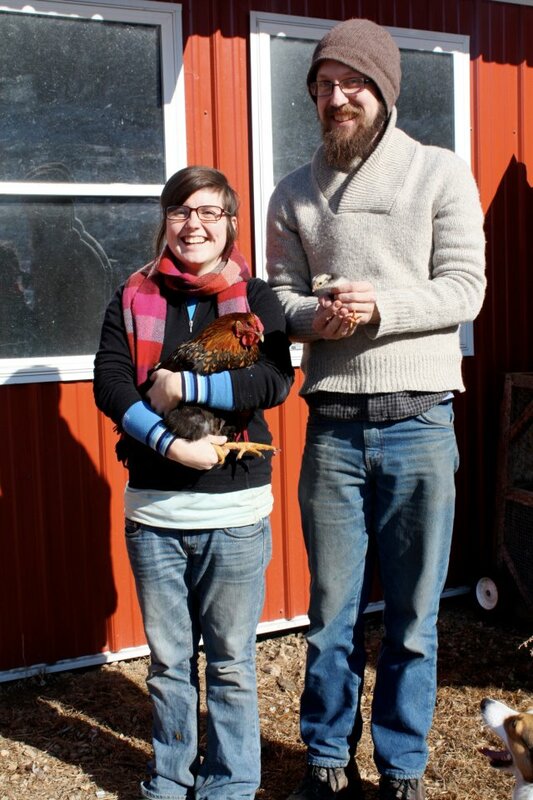 Ideally we would also be able to hold a couple Driftless Folk School classes there but we are not attached to that anymore because we really just need to find a place! Please keep us in mind with ideas of any kind!